Tomorrow I will be installing my new headlight housings with upgraded bulbs and next I'd like to improve the fog lights somehow. I'm not sure if I should remove the originals, polish the lenses and upgrade the bulbs or get all-new aftermarket fogs? Anyone upgrade with good results? I did a HID conversion to her Monte Carlo, She smashed into things and destroyed them, but it was cool for a while. The fog bulbs should be 889's, there are LED replacements for them out there. They would be approx 6000k, more filaments there are the brighter the bulb will be. I did an LED upgrade a few years ago to my fogs, those are the *much-more-difficult-to-do* H3's, the 889 LED's should be an easy into the lamp housing with no fuss. What vehicle had the H3's for fogs? Mine calls for either H3s or 889...I gotta get under the car and look what bulbs I actually have. Are the LED's plug n play? For 94-96 the coupe (with the later fog lamp design) made use of 889's. The earlier cars (like mine) use an H3 for the older fog lamp design. The 889's should be plug & play. The older fog lamp H3's are not, the H3 is a relatively short bulb, the older fog housing is a relatively short housing. The LED H3 will not fit into the housing without modification (the bulb mount at the bottom has to be custom shortened) just to get the bulb into the housing & clear the glass lens. Okay sweet. Just ordered these. If each of those is 900 lumens that is approx. what the halogen low bulbs are. I used these, but from a vendor that's gone now. I wonder what it's like to live in an area that has fog so often. We get fog here--occasionally--and sometimes fairly heavy. And light snow with a little wind that's functionally the same as fog in terms of visibility. Yet I've rarely felt the need for fog lights. Driving lights would be awesome--except there's always oncoming traffic or someone in front of me, so I could never use 'em anyway. There's an unlimited supply of mental defectives around here that drive all damned day or night with four or six headlights going (Low beams + fog lights, high beams + driving lights, low beams + fog lights + "halo" crap, low beams + second set of low beams from the snow plow lights, plus fog lights, etc) with NO regard to fog or oncoming traffic. Who uses fog lights when it's not foggy? Idiots. I used to spend a lot of time in a region with heavy fog over several years, it was really scary to drive because it was also a prime hunting area with a bunch of corn fields so it was common to see deer. At the time I had a very nice set of halogen fogs on my DD truck and almost daily used them with the headlights off to help avoid Bambi hood ornaments. White light just gets diffused by fog and makes it harder to see, I liked a light shade of yellow personally. There were expensive lights that projected a flat beam to cut through fog but I never tried them. 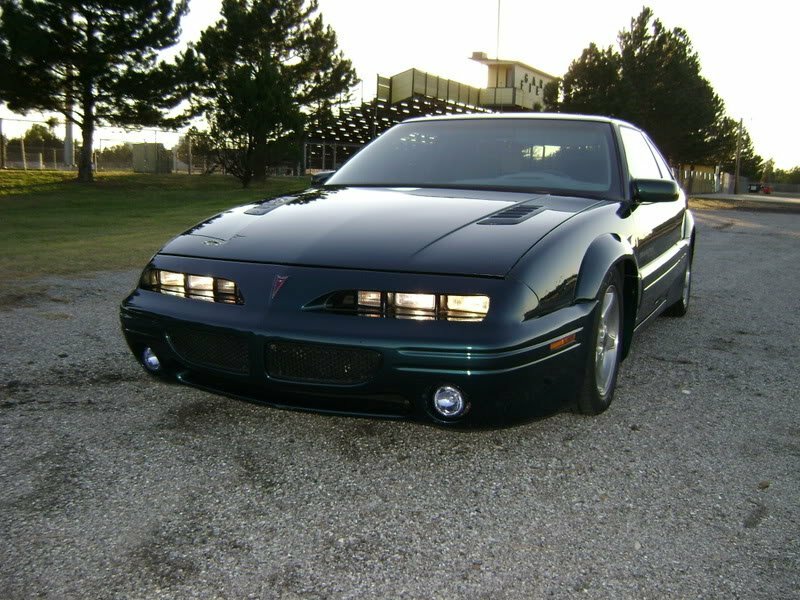 Old thread, I know, but I figured I'd add that pwmin installed some sort of aftermarket foglamp assembly in a 96 GTP I bought that he had owned. They looked damn good and were substantially brighter than factory ones. I have no clue if he knows what brand those were 12 years on. Those look like 17's on that car. Maybe you just have the smaller sidewall tire. And what are you lowered with? Car looks great! Wheels and tires were the factory 16x7s. It had ST lowering springs in the front at the time of that picture. It looked ok, but rode like absolute garbage. I later put FE3 springs on it with one coil cut. Kept it lowered and it rode like factory. Coilovers in the rear. Just looks like you have lower profile tires than my 225/60's. Looks good either way! Do you have any pics of the car as it sits now with the cut front springs and rear coilovers? No, sorry. I sold it several years ago now. Don't have many pics of it. Cutting one coil lowers roughly 2".